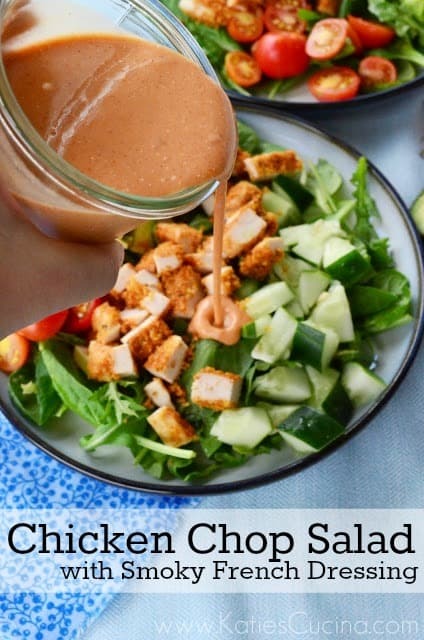 Back in the summer I posted this lovely recipe for Chicken Chop Salad with Smoky French Dressing, and then my server where I host my blogs decided to crash. And it ate ALL the post I published for the entire week. Like everything… even stuff I had scheduled out. I was a little devastated. And If I remember correctly this was right around the same time I had just learned I was expecting a baby! So one can only imagine the hormones flying. I was freaking out but at the same time just let it be… I did repost almost all the post that I had published that week, minus this recipe for Chicken Chop Salad with Smoky French Dressing. By the time I got to this recipe I just didn’t have the energy. So I saved it in my archives for a rainy day. 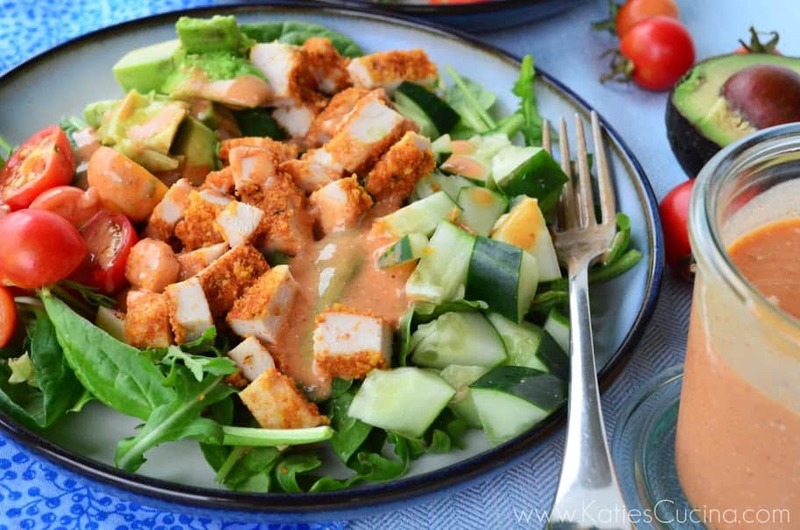 Since most people (minus myself) are on a healthy food/dieting kick I figured I would post this delicious and tasty recipe for Chicken Chop Salad with Smoky French Dressing. I utilize leftover crunchy-baked chicken strips with fresh produce and homemade dressing to make a simple lunch or dinner. I love making homemade dressings. They don’t take long at all to make and the best part is that 99.9% of the time you have all the ingredients on hand. Don’t get me wrong, just because I’m not on the diet train doesn’t mean that I’m not enjoying my fair share of salads. I eat a salad just about every night with dinner and will occasionally have them as a snack too! 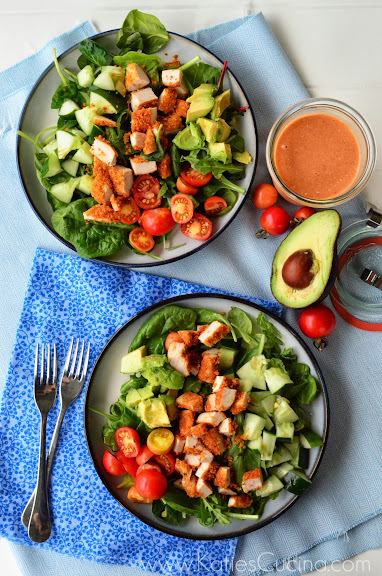 Layer on a plate, spinach, cucumber, cherry tomatoes, avocado, and chopped chicken. In a jar combine 1 the minced garlic clove, ketchup, red wine vinegar, olive oil, mayonnaise, and smoked paprika. Cover and shake until well blended. Pour dressing on salad and enjoy. 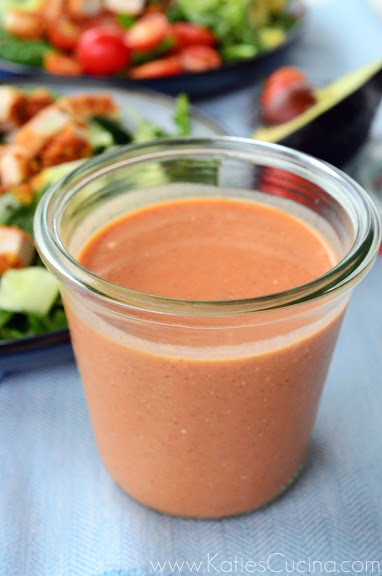 Store leftover dressing in the refrigerator for up to one week. Beautiful salad! All that green is so pretty! I would seriously eat this right up and then lick the plate clean of the dressing! The dressing is so good, Nikki! Thanks Ashley! Yes–I love having leftover chicken in the fridge to add to salads. Perfect work lunch!